In 1834 Englishman Edward Markham travelled throughout the Hokianga district and the Bay of Islands. Probably based on records kept at the time of his journey, Markham wrote up his experiences in a manuscript he called 'New Zealand or recollections of it' around 1836 or 1837. It was published in 1963. The manuscript contains a painting of the United Tribes' flag. Markham doesn't seem to have been present when the flag was chosen, and presumably saw it flying some time later. He didn't always get his facts right, and his flag is not precise in detail, in part because the painting is a watercolour. 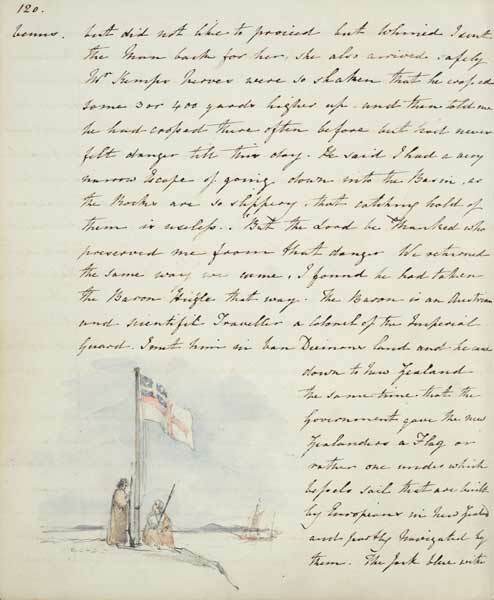 In the manuscript Markham wrongly described the flag as 'The Jack blue with a white cross and a white star in each corner in a St George Enseign' (Edward Markham, New Zealand or recollections of it. Wellington: Government Printer, 1963, p. 73). In the painting the smaller cross in the upper quarter is white (the original was red) and does not have a border. The stars are impressionistic in style and lack clear points.